Boxed set is ready to present. Handcrafted Château Dégustation four-piece set. Set includes one each of: Tumbler #2 (3.8"T, holds 12.85 ounces), red wine glass (8.5"T, 12.85 ounces), white wine glass (8.1"T , holds 12.85 ounces), and champagne flute (9.5"T, 7 ounces). Lead crystal. Hand wash. Made in France. From the Mille Nuits Collection by Mathias. Handcrafted flute. Full-lead crystal. Venetian-style, beveled cut. 11.25"T; holds 5.875 ounces. Hand wash. 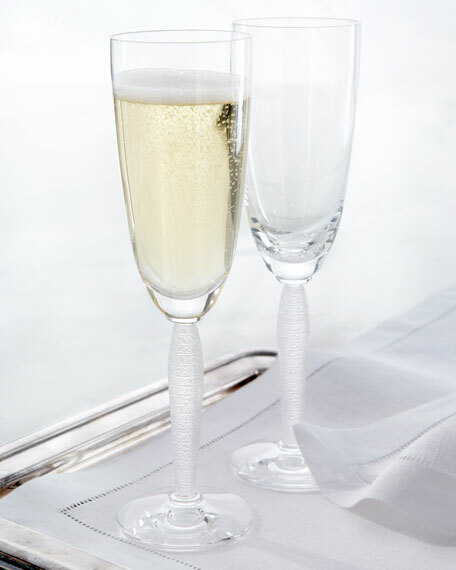 EXCLUSIVELY AT NEIMAN MARCUS Handcrafted, hand-painted glass faceted flutes. Assorted four-piece set. Golden rims. 2.4"Dia. x 9.25"T. Hand wash. Made in Italy. EXCLUSIVELY AT NEIMAN MARCUS Handcrafted flutes in NM gift box. Glass. Approximately 3.5"Dia. x 10"T. Hand wash. Set includes one of each design shown. Imported .